Our durable screw posts will securely hold your portfolio, scrapbook, menus, and so much more. 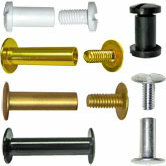 We carry black, gold, antique brass, and silver aluminum screw posts and extensions in most popular sizes. 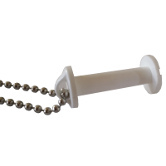 We also stock solid brass screw posts, steel screw posts, and plastic screw posts in white and black. Buy in bulk and save!